Click on the above picture to see a larger version. It is a rough approximation of a Coehorn mortar but with some brass highlights thrown in. 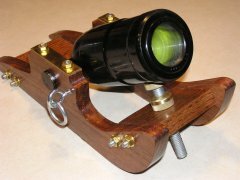 The frame/sled is red oak with a ½" elevation screw and brass fittings. 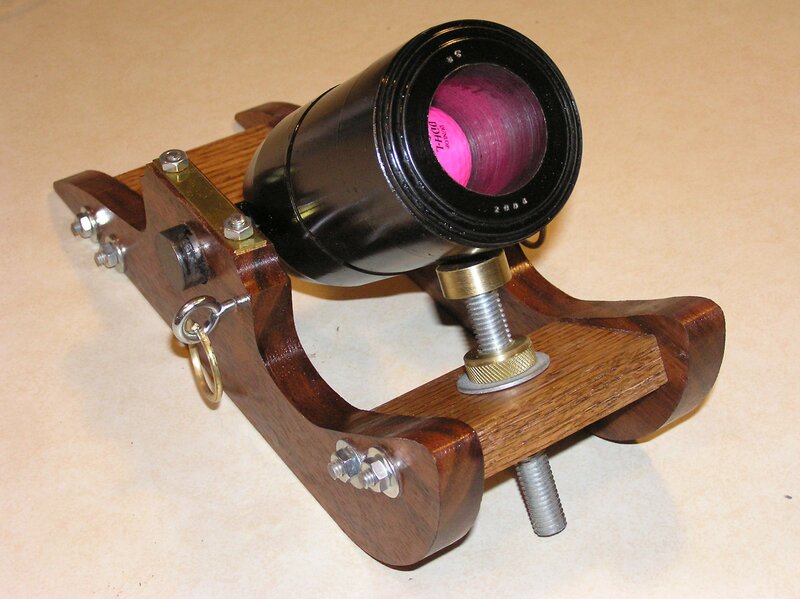 The barrel is 3" CRS (cold rolled steel) bar machined on a lathe. No welding was done on the barrel, it is connected to the 1" trunnion bar with 5/16" machine screws. (see here for rear of mortar) The bore is 1 11/16ths for 4 inches and then reduced to 1" for the last 1 ½ inches. The glow inside the barrel is a luminous golf ball waiting to come out. Fun to make. I tried to use off-the-shelf items and not get fancy. I only had to machine the barrel and the elevation screw nuts. Lacquer coating and gloss black for the barrel made it look nice. It took about six evenings after work to get it together. Like others who have made mortars like this, I was amazed when I discovered how far it tosses a golf ball. 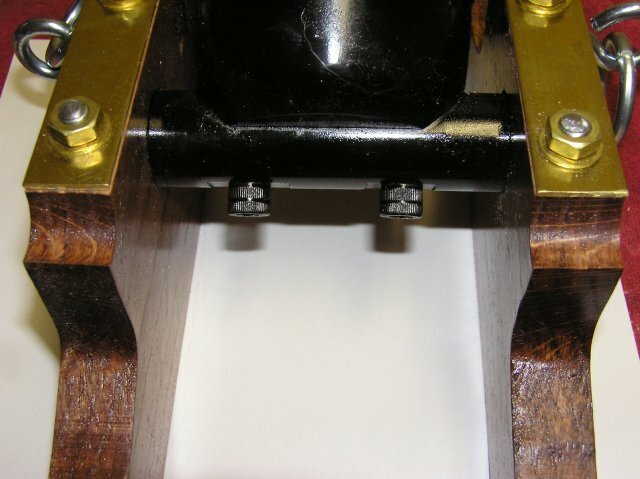 The first time I fired it, I had it at about 50 degrees elevation and had poured the powder chamber full of 3F Pyrodex - around here Pyrodex is easier to get than blackpowder so I was hoping it would work. No wadding was used and the golf ball (in fact, the luminous one in the photo) was placed on top of the powder. When it went off, the golf ball simply disappeared. Above is a reconstruction job on one of those Napoleon III 12 pounder scale model cannons that are made in Spain and imported by several companies (including Dixie Gun Works and Cannon-Mania). The top picture is before and the bottom is after reconstruction. The cannon is 70 caliber and can shoot a 69 caliber ball; although I think most people shoot blanks out of them... they are only a couple of feet long and don't seem like something one should shoot lead out of for target practice. These cannon have been made for the last 40 years or so - and there are several slight variants. The above pictures are nothing like the new ones (or even like the old ones). The person who sold the above cannon to me had painted it a light green over the original lacquered wood finish. In addition a lot of hardware was missing. I repainted it with Civil War US olive drab coloring and added some of the hardware back on, including some missing carriage bolts, axle boxes, rams, sponges, bucket hook, pointing ring and handspike (both custom turned on the lathe), leather belts (homemade), hangers for the rams, a left-handed portzebie and fasteners. In addition, a crack that was starting in the carriage body was cinched up using wood screws and carriage bolts. Unfortunately, nothing is much like the original but it still looks pretty cool. 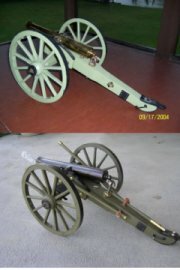 The brass barrel was replaced with a black one and the brass (plated) version was put on another carriage that was close to original (it increased the looks of both examples). Click on the above image to see the larger version. I secretly had some hopes of mass producing the above model... however, and after building it, I discovered that it takes nearly as much work to make a small model as it does a bigger one. I would have to put a price on the model that would scare away any buyers. The above model is similar in construction to the same models you can get at Dixie Gun Works or Cannon-Mania for around $170.00 new or on eBay for $60-$100 used. It was designed to be about the same size. After that, I got kinda eclectic. I combined brass, steel, paint, red oak, goo gahs, and polishing to come up with the above example. Click on it to see a larger version. The barrel is about 8 1/2 inches long and it is in 38 caliber (the ones available commercially are usually about 44 caliber). The wheel circumferences are covered with neoprene to stop marring (but who are we kidding here ... it never gets moved once it is put on the mantel!). Since it is polished and clean, I probably won't fire it - I have other models to make noise. Firing blackpowder causes things to get tarnished - pieces of smoldering fuse are the first thing to land on the wood and make what looks like a cigarette burn. My mortar looks like someone was using it for an ashtray. NOTE! The above are not my nor Dixie Gun Works recommendations if the cannon you are using is not theirs. 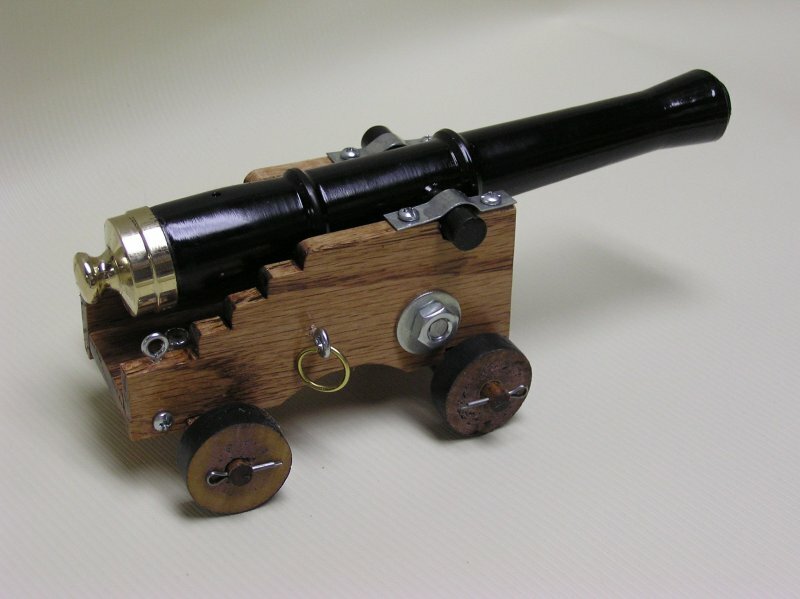 You must take responsibility for the integrity of the barrel if you made the cannon.